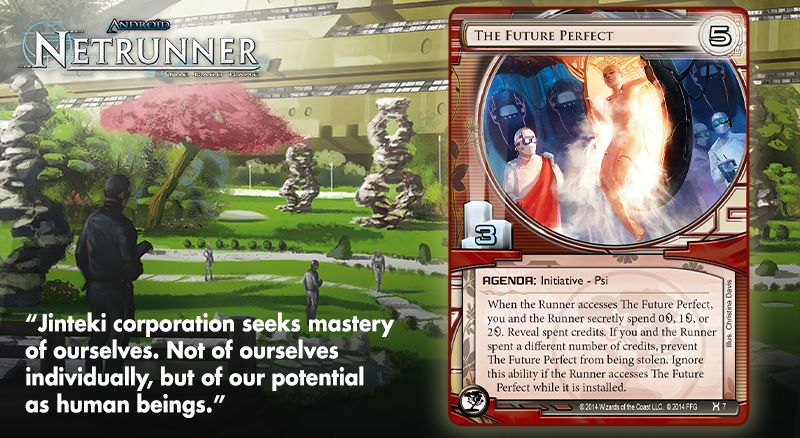 It's a bold new age for Android: Netrunner. 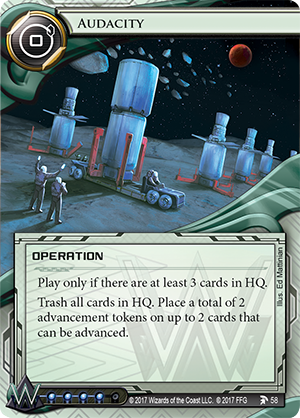 Rotation, the Revised Core Set, and the new Most Wanted List (pdf, 5.8 MB) have altered the landscape faster than the Weyland Consortium's redevelopment efforts. Many of the world's most notorious cybercriminals have gone missing. 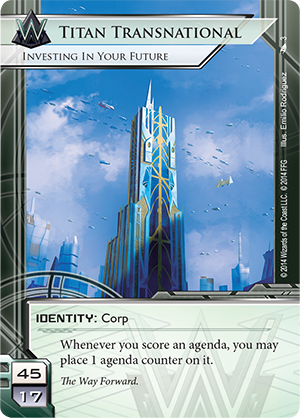 The Big Four megacorps have completely disbanded some of their oldest and most well-established divisions. 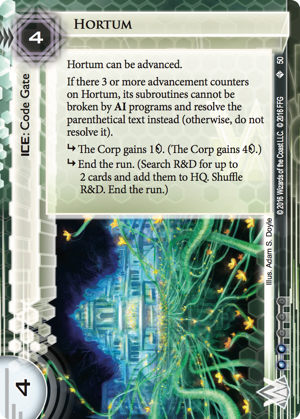 And there are sysops who speak in hushed tones about the hostile alien AI rumored to be stalking the Net. 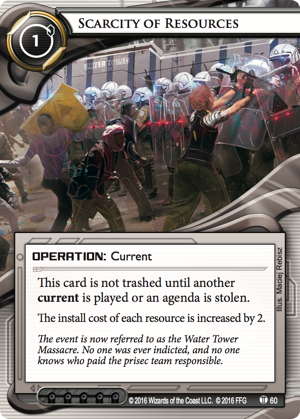 This is a day with no clear hierarchy of power. It calls for clear-headed thought, for creative vision, and for action. After all, today's uncertainty is the backdrop of tomorrow's most fantastic successes. Some executive is going to see through the day's confusion and back an agenda that establishes his or her corp as the one to beat. 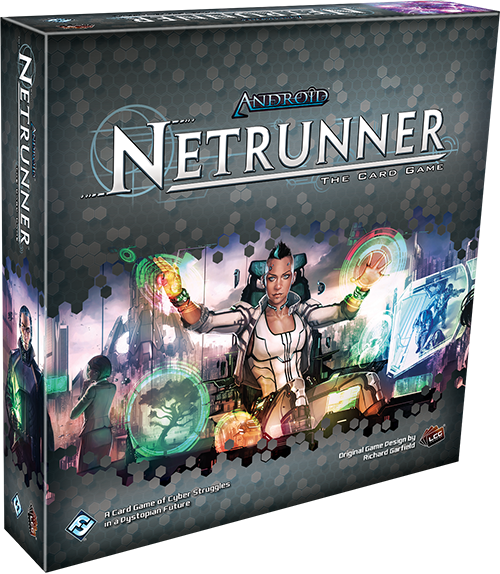 With that in mind—and as we look forward to the 2017 Android: Netrunner World Championships—we have decided to hire 2016 World Champion Chris Dyer as our consultant. 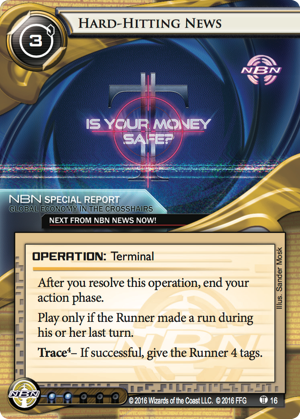 In our last look at Android: Netrunner and the Revised Core Set, Chris profiled the game's Runners, and today, he'll help us figure out how to position our Corp amid the changes to the world and the Net. What will we see at the 2017 Worlds? The honest—and exciting—answer is that nobody knows. People have a relatively short amount of time to test and there’s no existing data to draw upon. 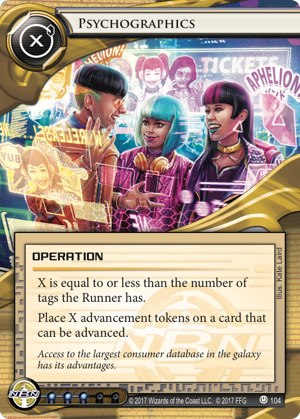 In general, though, I think Shapers are the Runner faction to beat and will make up the largest portion of the field, although I’d expect their decks to be spread across a range of different identities. 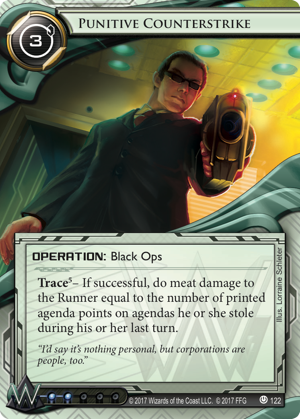 The Corporation side, on the other hand, is likely to be a bit closer, and all four factions stand a good chance of making the cut. Chris Dyer with the trophy from his 2016 World Championship. 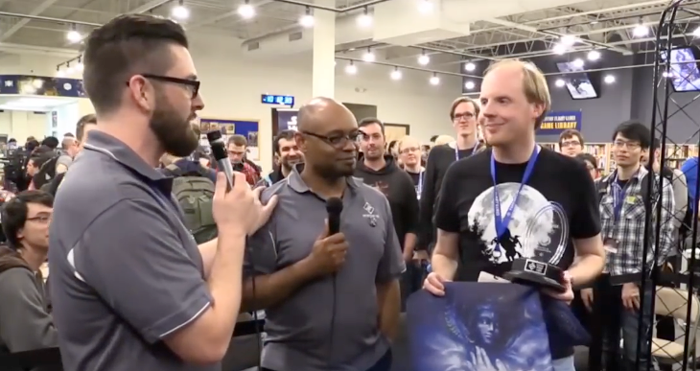 You can watch his match on YouTube. 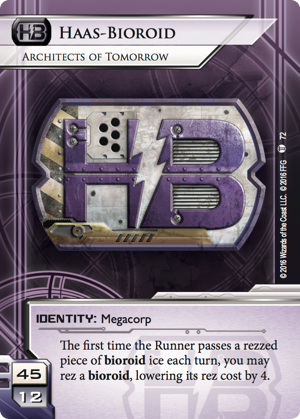 There have only ever been two really successful identities played out of Haas-Bioroid. 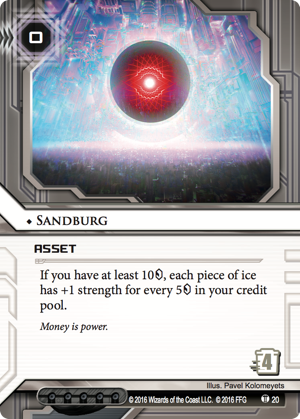 One of those, Cerebral Imaging (Creation and Control, 1), was exclusively home to a variety of combo decks that will no longer exist because Accelerated Diagnostics has rotated out. 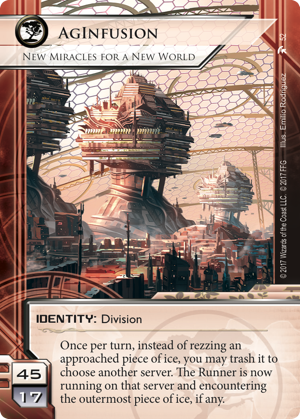 Every other top-tier Haas-Bioroid deck since the Core Set was first released has been played out of Haas-Bioroid: Engineering the Future, which is unrivalled in its efficiency and economy. 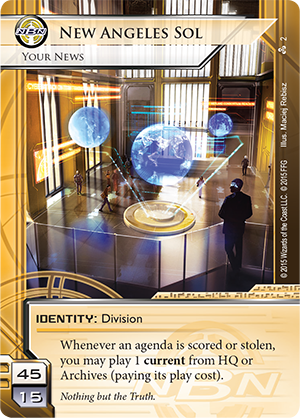 This fact led to a certain homogenization of the faction; when all the top decks are being played out of one identity, they tend to converge, even if they are pursuing broadly different strategies. 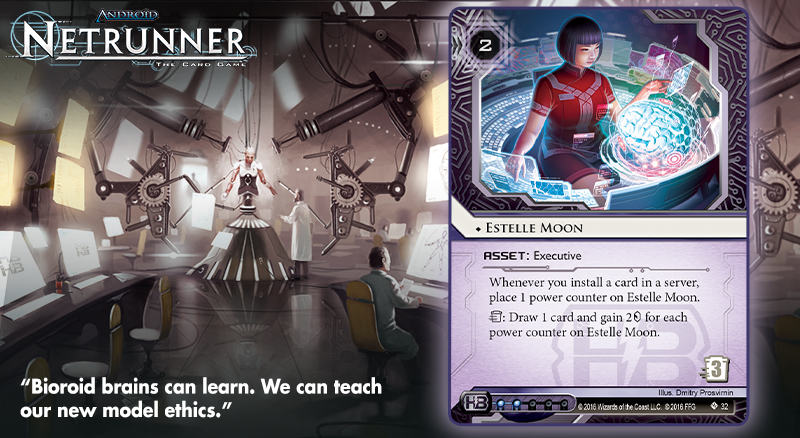 The most recent of those decks is built around the terrifying efficiency of Estelle Moon (Terminal Directive, 32) and has been dominating the competitive world for the past few months. 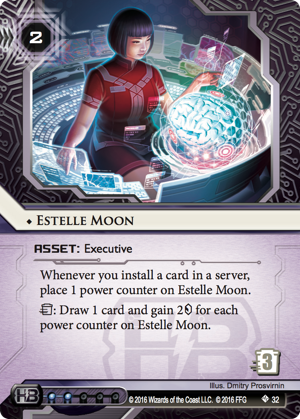 That deck has rightfully been decimated by the Most Wanted List, with Clone Suffrage Movement and Friends in High Places removed and Estelle Moon and Fairchild 3.0 (Escalation, 49) both restricted. 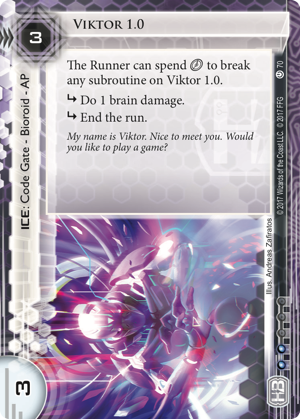 However, the core engine of that deck is so good that it might still live on, most likely played out of Cerebral Imaging using Violet Level Clearance (Quorum, 111) and Ultraviolet Clearance (Terminal Directive, 38) to provide quick and easy money and card draw. 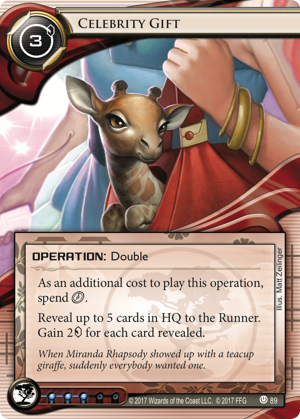 In fact, that combination of Cerebral Imaging and Clearance operations looks like it's strong enough to support a range of decks, ranging from rush strategies, to threatening Punitive Counterstrike (Revised Core Set, 122), to taxing builds that use Bryan Stinson (Quorum, 117) and Sandburg (23 Seconds, 20). 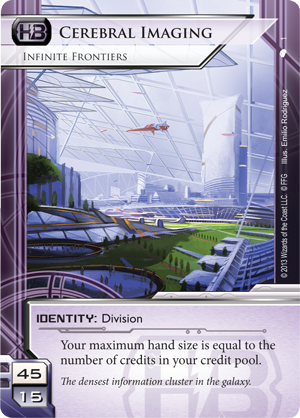 I expect Cerebral Imaging to be the new go-to identity for Haas-Bioroid players in the near future, and it’s likely to be well represented at Worlds. 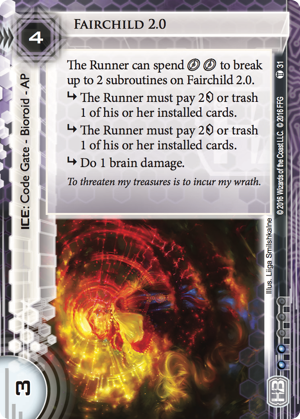 Another positive for the faction is that the rotation of Yog.0 and Parasite means that ice like Fairchild 2.0 (Blood Money, 31) and Viktor 1.0 (Revised Core Set, 70)—which previously saw zero tournament play—are now much more appealing prospects and can charge the Runner a serious tax for a relatively small investment. 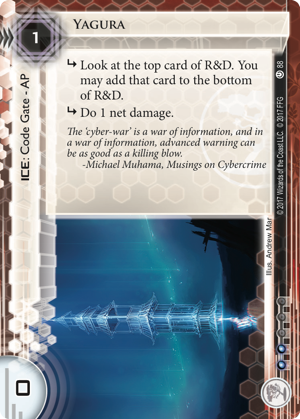 It’s likely that decks like NEXT Design (Creation and Control, 3) or Haas-Bioroid: Architects of Tomorrow (Intervention, 72) will look to exploit ice like this in a rush-based strategy. 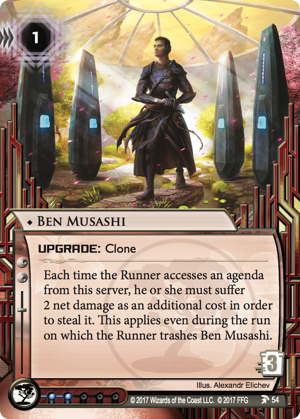 This can be supplemented by using cards like Biotic Labor (Revised Core Set, 72) and MCA Austerity Policy (Crimson Dust, 111) to add a fast-advance element. 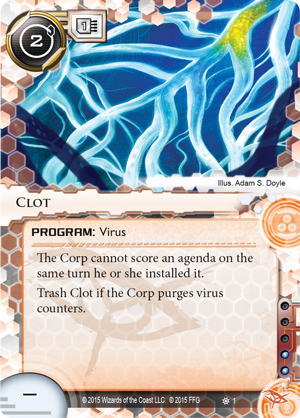 However, these decks will also need to find a way to score past the expected popularity of Shapers who can play Clot (The Valley, 1) to shut down this line of attack. 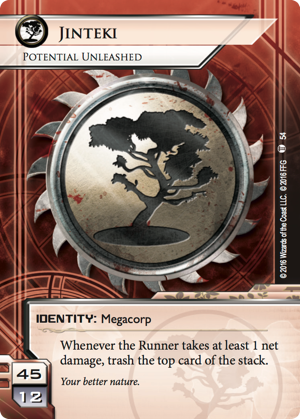 Much like the Shapers on the Runner side, Jinteki appears to be the obvious winner of the brand-new meta. 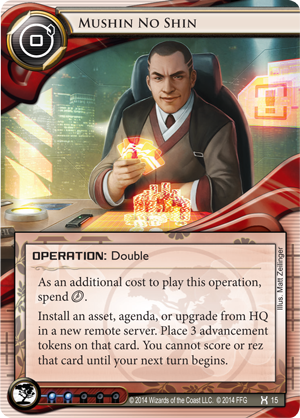 Key cards that were set to rotate out, such as Celebrity Gift (Revised Core Set, 89) and Ronin (Revised Core Set, 81), were preserved by the Revised Core Set, and they have the best defensive agenda suite in the game with The Future Perfect (Honor and Profit, 7), Obokata Protocol (Blood and Water, 70), and Nisei Mk II (Revised Core Set, 79). 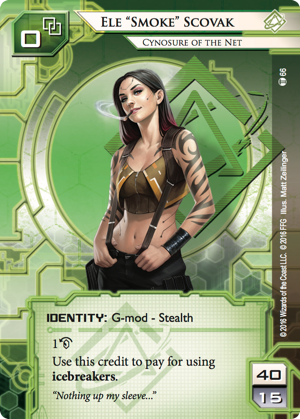 There’s just one problem, which is that they have always relied on Caprice Nisei to protect their servers, and she is an option that they will no longer have. 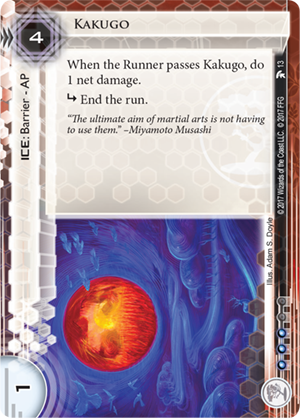 The other big benefit that the Revised Core Set has provided is the removal of Parasite, which makes Jinteki's very powerful, low-strength ice—such as Kakugo (Daedalus Complex, 13), Komainu (Honor and Profit, 17), and Yagura (Revised Core Set, 88)—much more likely to stick around. 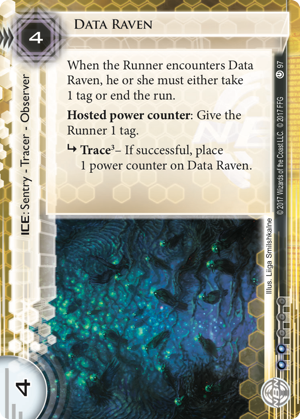 These ice present a serious tax to the runner while dealing or threatening net damage, and Jinteki seems most likely to achieve competitive success by doubling down on this core theme. 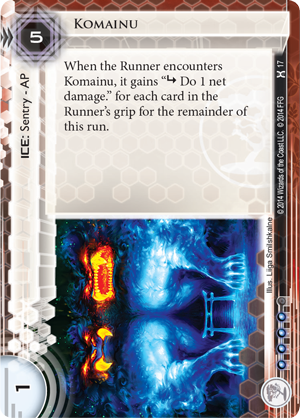 That focus on net damage is likely to come in one of two forms. 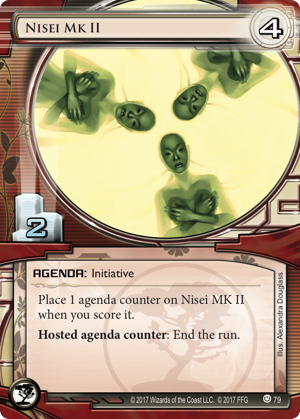 The first will be the latest iterations of the classic Jinteki shell game, which uses the threat of net damage and a myriad of face down servers to heap uncertainty upon the Runner, allowing Jinteki to either score agendas from the table or flatline the Runner with net damage if he or she makes a mistake. 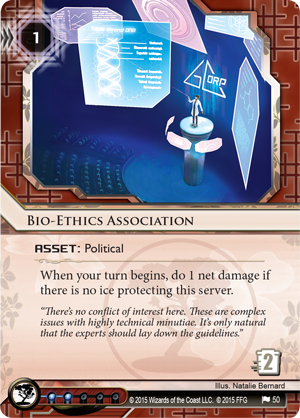 In the past, the strongest versions of these decks used Bio-Ethics Association (Democracy and Dogma, 50) and Hostile Infrastructure (All That Remains, 83) to stymie Runners, while protecting the assets with the Industrial Genomics identity (The Source, 105), but this style of deck was hit hard by the Most Wanted List with the restriction of key pieces in Bio-Ethics Association, Estelle Moon and Obokata Protocol. 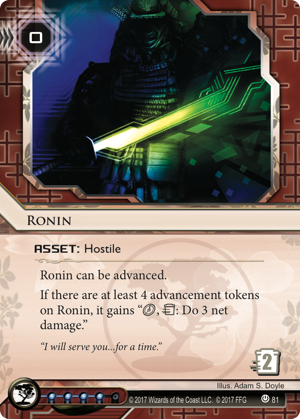 Instead Jinteki players will have to rely on the misdirection that has long characterised the faction, so expect decks built around cards like Mushin No Shin (Honor and Profit, 15) in either Personal Evolution (Revised Core Set, 77) or Potential Unleashed (Escalation, 54). 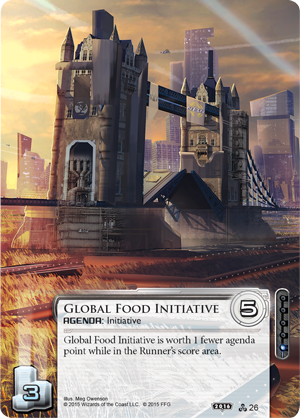 The second option is a more defensive build using either AgInfusion (Earth's Scion, 52) or Palana Foods (Business First, 30), which uses net damage ice and upgrades like Ben Musashi (Earth's Scion, 54) or Hokusai Grid (Revised Core Set, 92) to threaten the Runner’s hand size, thus making agendas like Obokata Protocol prohibitive to steal. 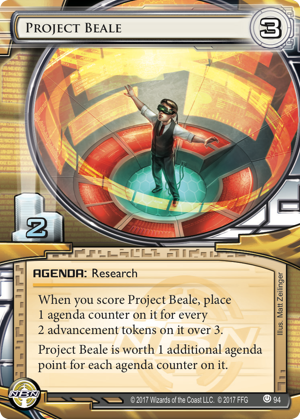 Unfortunately, the second agenda that would have fit this build, Fetal AI, is no longer available post-rotation, but there still looks to be plenty of support for this approach. And both identities, particularly AgInfusion, also benefit from the restriction of Employee Strike (Data and Destiny, 53). 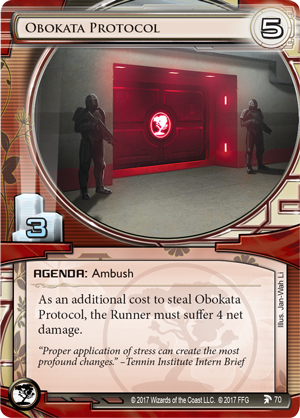 I expect Jinteki to be a popular pick for Worlds, with almost all of the decks using Obokata Protocol as their restricted card and using net damage tricks to make it hard to steal. 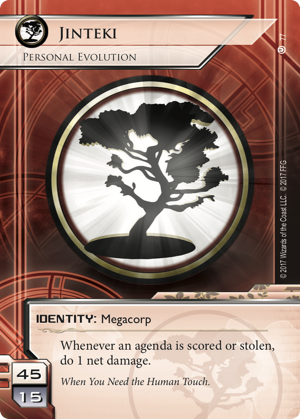 These decks will be a real threat towards the end of the tournament, and are more than capable of winning the whole thing. 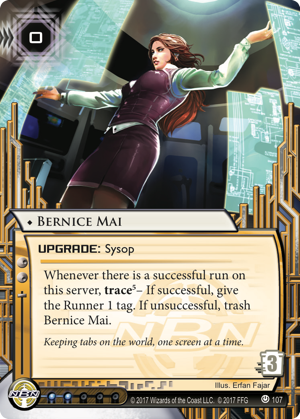 NBN had been at the top of the competitive world for a long time, but they have been in decline somewhat recently, with only Sync's combo kill deck still represented at top tables. 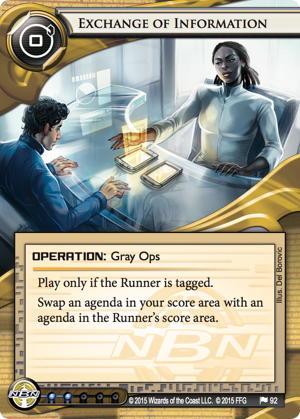 That deck, and the kill decks that preceded it, however, no longer exist thanks to the removal of Breaking News from the Revised Core Set, so NBN will need to look for a new strategy going forward. 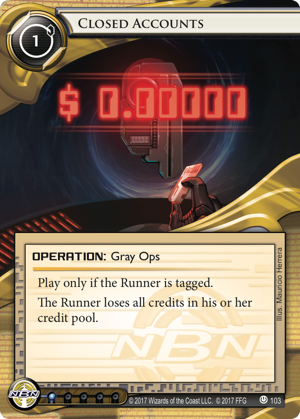 NBN has always been a faction defined by tag strategies with a smattering of fast advance, but those fast advance elements were so powerful that they came to dominate the competitive face of the faction. 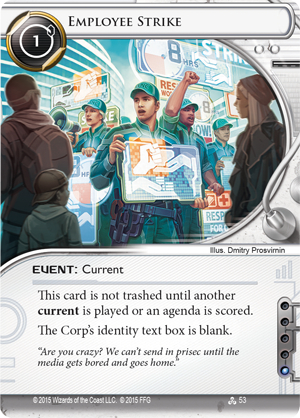 Cards like AstroScript Pilot Program, SanSan City Grid, and Breaking News shaped how the faction was played, and all of them have now been removed from the Revised Core Set. 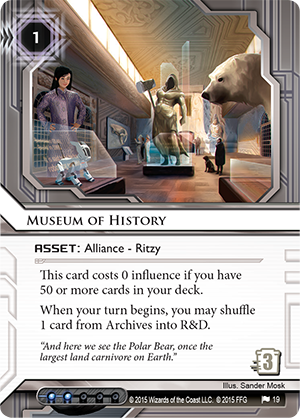 That means that the faction will be forced to fall back on its tagging heritage in the search for strong decks. 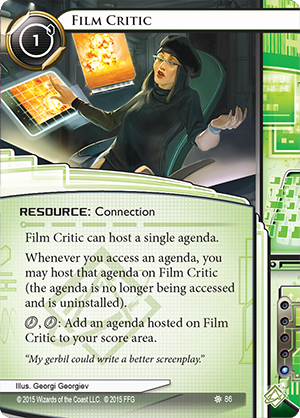 On the bright side, the Revised Core Set has saved several cards that would otherwise have rotated, such as Pop-up Window (Revised Core Set, 99), Wraparound (Revised Core Set, 101), and Bernice Mai (Revise Core Set, 107). 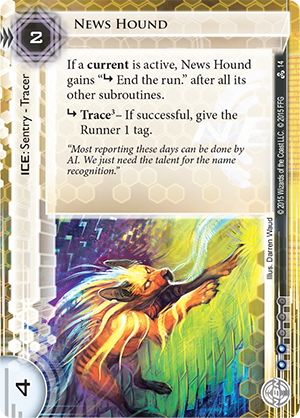 Additionally, NBN has a good range of ice that includes News Hound (Data and Destiny, 14), IP Block (Martial Law, 94), Turnpike (Data and Destiny, 18), Data Raven (Revised Core Set, 97), Archangel (Data and Destiny, 13), and Resistor (Data and Destiny, 15). 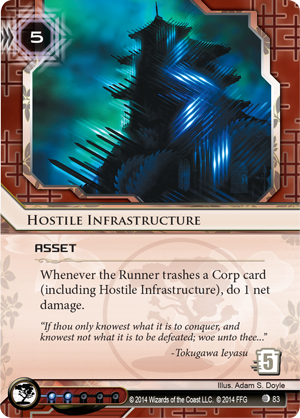 Still, the faction might lack the powerful threat cards that will force the Runner to brave these nasty servers before they’re ready. 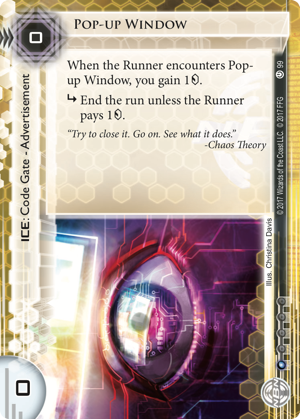 If they can force the Runner to accumulate tags, then Psychographics (Revised Core Set, 104) and Project Beale (Revised Core Set, 94) are as powerful a closing combination as you will find. 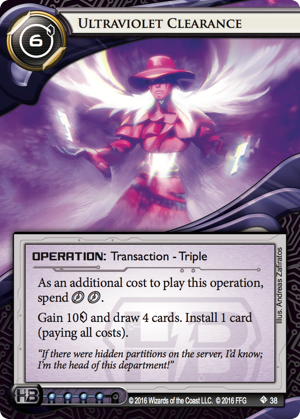 The other boon for NBN is that Aaron Marrón, a card which single-handedly shut down any tag-based strategy, has been removed by the Most Wanted List, once again allowing decks built around powerful tag punishment effects like Exchange of Information (The Liberated Mind, 92) and Closed Accounts (Revised Core Set, 103) to become playable options. 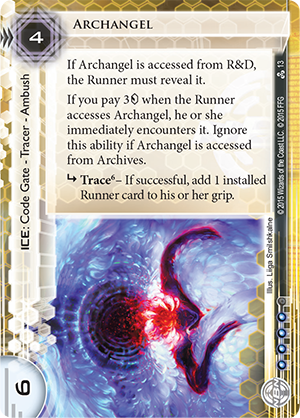 The strongest NBN deck looks like it might be a New Angeles Sol deck (Data and Destiny, 2) built around tagging and taxing ice. 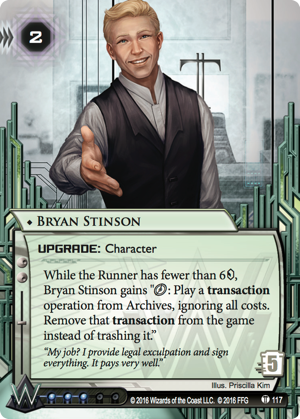 Almost every Runner deck seems like it will rely heavily on resources to power their economy and draw, which means that Scarcity of Resources (Escalation, 60) is as powerful as it’s ever been, and no deck is better suited to keeping it in play. 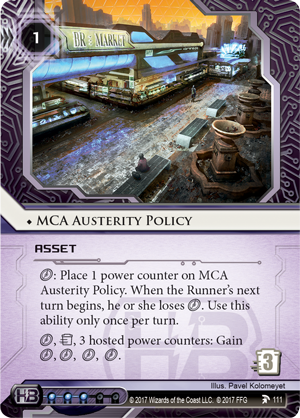 Now that Aaron is gone and Employee Strike is restricted, we may also see the return of Controlling the Message (23 Seconds, 17), probably built around MCA Austerity Policy and the threat of Hard-Hitting News (23 Seconds, 16). 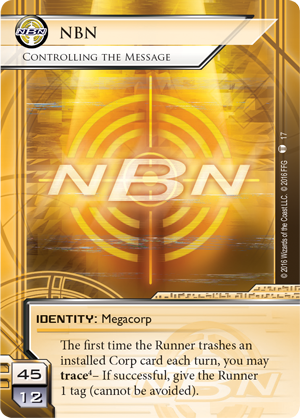 NBN are certainly a bit behind where they used to be, and it may take some time to get used to their decks now that some of their most iconic cards are removed. 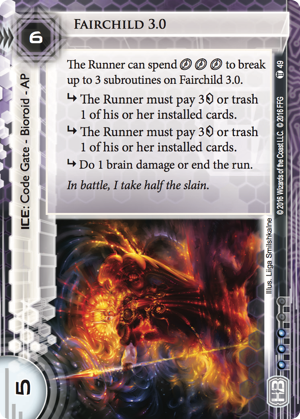 But I think they still have the pieces to support a few reasonably powerful builds. 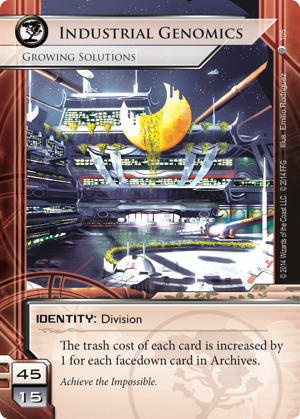 Like Anarch, I think that the World Championships might come a little too soon for them to truly compete at the highest level, but I wouldn’t be surprised to see a smattering of NBN decks in and around the cut. 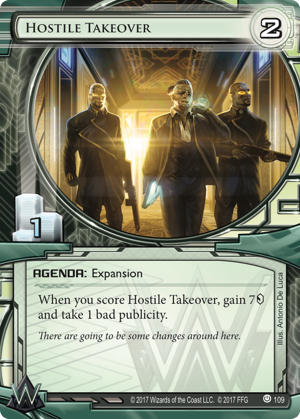 For a long time Weyland have seen the least representation at tournaments, but their fortunes have changed. 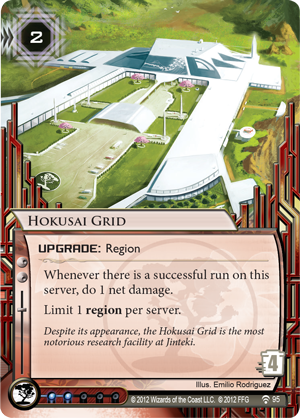 They have started to have an impact on the competitive scene, mostly due to powerful cards released in Terminal Directive and the Red Sand Cycle such as Audacity (Earth's Scion, 58), Hortum (Terminal Directive, 50), and Hunter Seeker (Terminal Directive, 51). 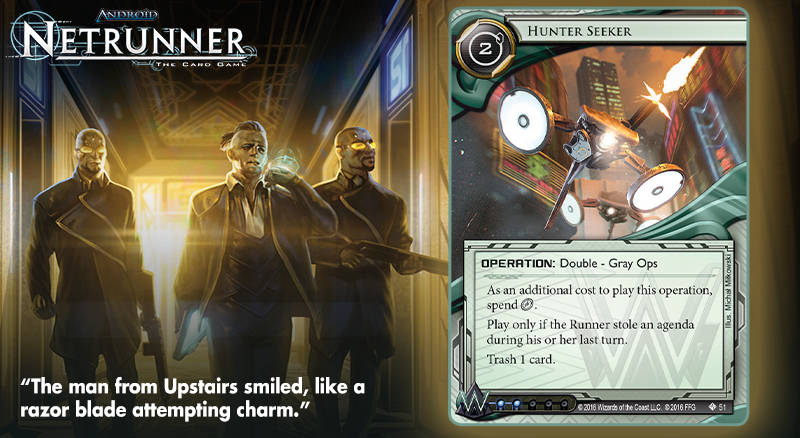 Most of these decks are rush archetypes that try to score agendas quickly, then respond with Hunter Seeker or meat damage if the Runner manages to interfere with their plans. 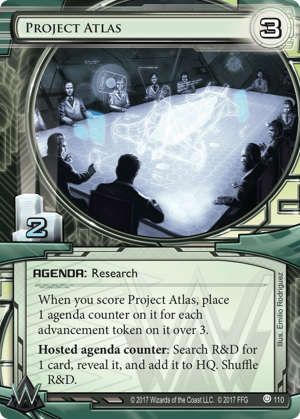 Rotation was a worrying prospect because Project Atlas (Revised Core Set, 110), which is easily Weyland’s best agenda and is central to all of its best strategies, was due to rotate out, but it has now been included in the Revised Core Set. 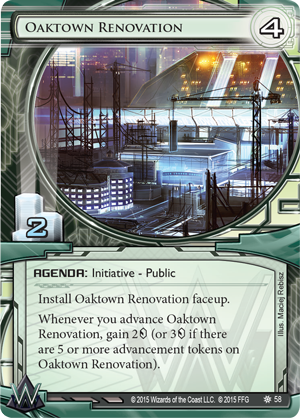 That gives Weyland an ideal agenda suite for rush strategies that also includes Oaktown Renovation (Chrome City, 58) and Hostile Takeover (Revised Core Set, 109), and as the other top cards for this strategy were only released recently, the current environment's competitive decks are virtually untouched by the new tournament rules. 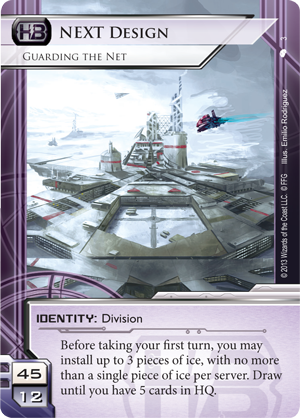 It’s likely that these decks, played out of either Titan Transnational (Order and Chaos, 3) or Skorpios Defense Systems (Terminal Directive, 41), will continue to be popular post-rotation. 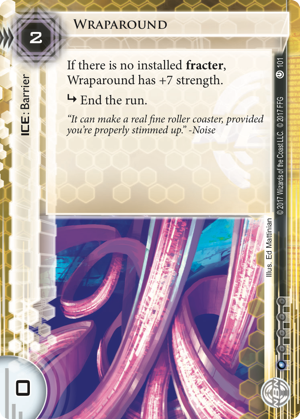 The only issue is that Shaper looks likely to be widely played, and with Film Critic (Old Hollywood, 86), Self-modifying Code (Creation and Control, 46) and easy, effective access to Clot, they have strong counters to many of the problems that Weyland's best decks tend to pose. 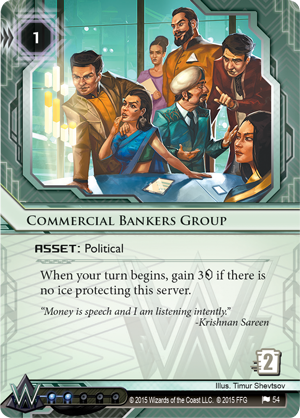 The other Weyland deck that has been competitive in the past is an asset-based approach played out of Gagarin Deep Space (Order and Chaos, 2), relying on the identity to protect powerful early effects such as Mumbad City Hall (Democracy and Dogma, 55) and Commercial Bankers Group (Democracy and Dogma, 54). 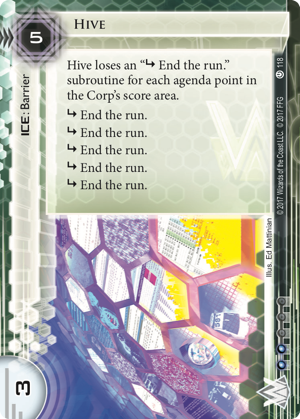 These decks don’t try to score agendas, instead winning via flatline, so the retention of Hive (Revised Core Set, 118) gives them a perfect piece of ice. 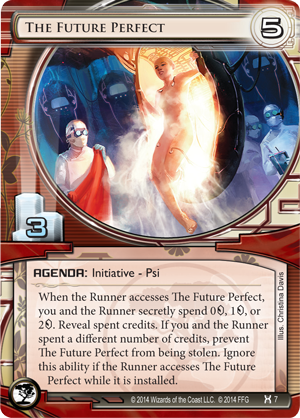 Even more relevant, the absence of Parasite means that Tour Guide (The Universe of Tomorrow, 118) becomes one of the very best ice in the game. 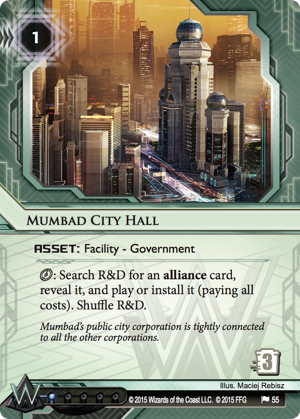 However, the Most Wanted List came down hard on this deck, removing two key pieces in Mumbad City Hall and Friends in High Places and restricting others in Museum of History (Kala Ghoda, 119) and Global Food Initiative (Data and Destiny, 26). 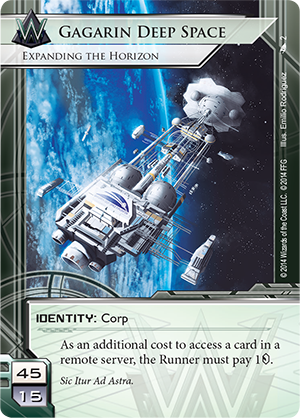 While this deck is probably still playable, I no longer think it’s strong enough to threaten the top tables of big tournaments. 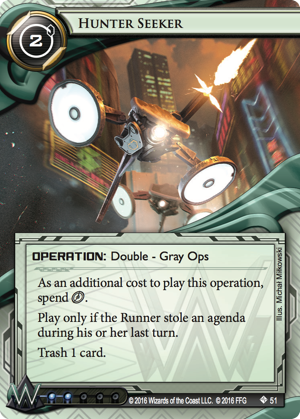 What Will We See at Worlds? 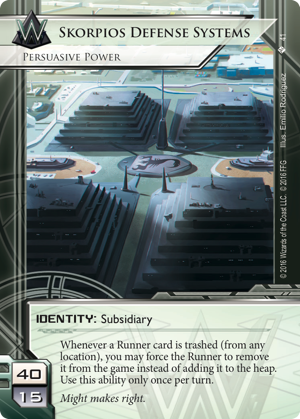 I expect a fairly diverse environment, with more people likely to just play a deck that they enjoy, and maybe a few really left-field decks that people don’t see coming. My best guess at the winner at this stage? It feels like throwing darts in the dark, but let’s say that Ele "Smoke" Scovak (Intervention, 66) and Cerebral Imaging will take the top spot. We won't really know until November 5th, but you can tune in to see if I’m right! 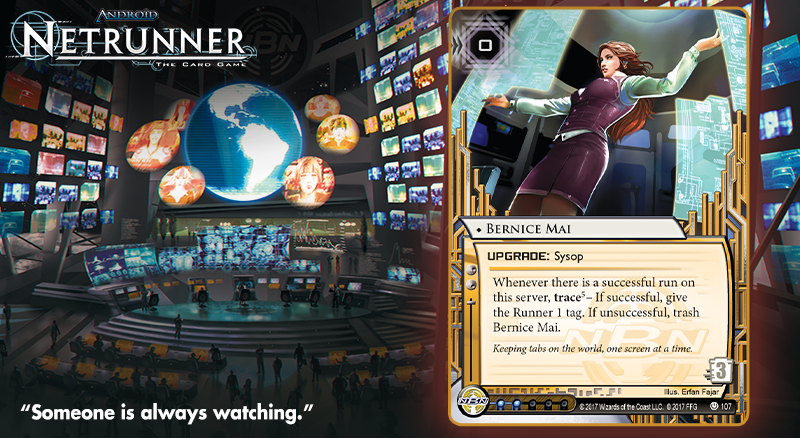 It's a new dawn for Android: Netrunner, and there's no limit to what the Corps might accomplish. 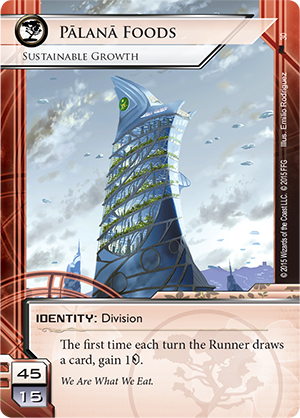 The sky's not the limit; the Beanstalk exploded that old limitation years ago. Luna's ripe for the picking, and Mars is becoming more hospitable every day. 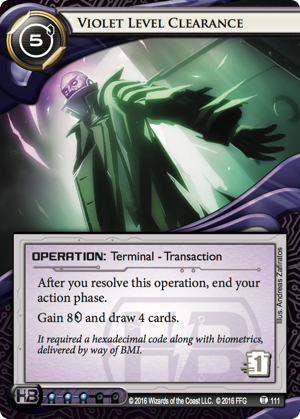 There's always the possibility that Jinteki may uncover a treatment to reverse the aging process, and even if they don't, Haas-Bioroid has been secretly making progress toward full transfers of consciousness. If they succeed, then even death itself may no longer hold sway over all humanity. 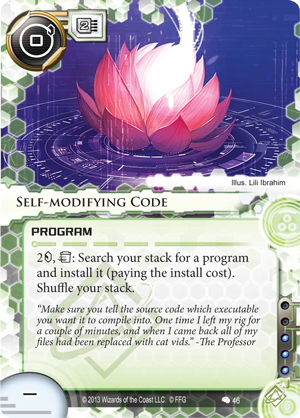 In this age, we see new decks emerging and old decks becoming viable once more. 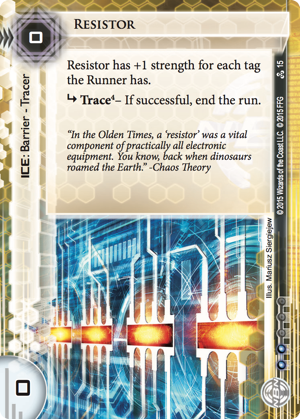 We see Android: Netrunner exploding with intricate bluffs and counterbluffs, as the Revised Core Set, rotation, and the new Most Wanted List have pushed the high-risk interactions between Runner and Corp to a new, all-time high. 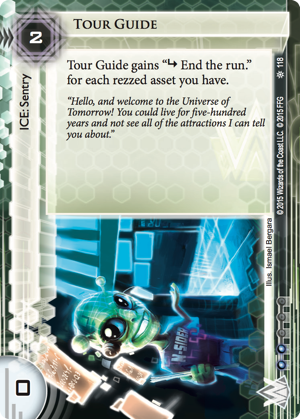 What will we see at Worlds? 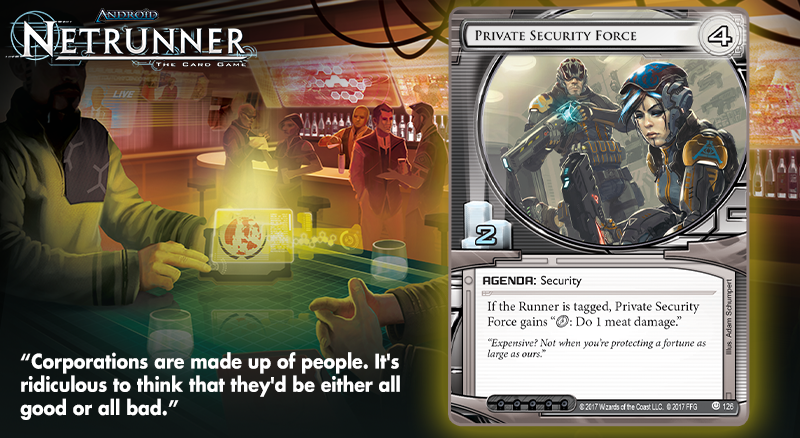 There's no telling which deck may win, so we hope to see you at the 2017 Android: Netrunner World Championships, and if you cannot join us, we hope you'll enjoy the game via our streaming on Twitch! 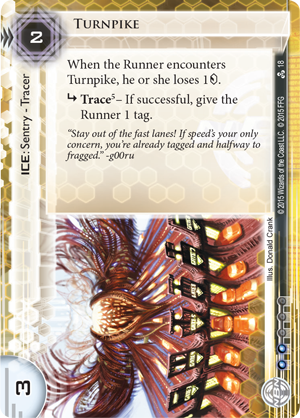 Pre-order the Revised Core Set (ADN49) for Android: Netrunner at your local retailer or online through our website today!